Well, I'm (Jodi) here in Florida following our fun HSN experience...wow...it is much harder than I thought! Don't forget to check out all of the great kits we offered on HSN.com! Anyway, I have heard from all but one of our chosen NEW team members, so I've decided to go ahead and announce without that person. Hopefully we will hear back from them soon! We'll be posting bios and pics of our new team to our website next week. We will also contact the 'runner up' scrapbookers next week to work out guest spotlights, etc.! It didn't work last year for that plan, but if you don't keep trying, you will never succeed, right? Thanks again to all who participated...you all rock your Fancy Pants! Don’t miss seeing us today on HSN’s Scrapbooking Show at 1pm EST and 6pm EST. We’ll have some great kits and great ideas for using our products!!! Technically it's still "tonight" in Utah! Before I even get started, I really, really, really want to THANK YOU all. This decision has been back and forth and back and forth...(thus, our looooooong delay) and we finally narrowed it down. We have selected 5 U.S. Members and 2 International Members to add to our team. I told you that we never selected only the number we had open---it's impossible with all of the amazing talent. And for those not selected this round, believe me, it was NOT lack of talent...that's why this process is so hard. Everyone has their own unique style and we just have to decide what fits our needs and product right now! I feel very lucky to be a part of such a great industry and amazingly talented people who are willing to put themselves out there and share their talents with others! I really understand what that takes after doing it myself for years and years! We have kept email addresses and entries on file for future reference if a spot opens and we just may contact you to help out with product testing, or trade show samples...you never know.... so keep that in mind! Thank you again for your patience and your support of Fancy Pants Designs products!!! not yet chosen!! I know that was so mean of me...but I just had to do it :)! I wanted to get on here and let you know that we know you are anxious to hear the winners of the DT...and we are just as anxious to know them!!! We simply haven't narrowed it down to the five yet. There were hundreds of fabulous entries...each one had something unique about it! We hope to be able to announce the 5 new members within the next few days! Thanks to all of you devoted Fancy Pants fans we definitely still have our work cut out for us!!! Please stay tuned...we are really trying to wrap things up!!!! 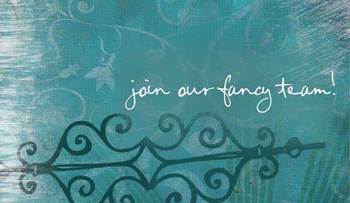 Fancy Pants Designs is looking for a full-time customer service representative to work at our office in Sunset, Utah. This person will be answering phones, responding to emails and helping with a variety of office duties and have first hand views at some of the coolest scrapbook products on the market! Plus, if you are skilled at scrapbooking (not required), you might find some time here and there to play with product! If you live in our area (Sunset is located about 10 miles South of Ogden) and are interested in applying for this position, please email your resume to jared@fancypantsdesigns.com . More job details will be given to those interested! Pay based on experience. Fancy Pants Designs is also looking for a part-time (or full time will be considered) in-house scrapbook designer (traditional and/or digital) to work with great, fresh new products! This person will be responsible for designing projects for shows, events and publications that Fancy Pants Designs participates in. They will also help with other miscellaneous office duties and projects. We may be able to work around hours depending on your/our needs. We are looking for designers with a great knowledge of scrapbooking, editorial and/or published works and a love for paper crafting of all kinds! Digital scrapbooking is not required, but preferred. If you are interested in applying for this position, please email your professional resume and scrapbooking experience/resume AND several images of your most recent work to jared@fancypantsdesigns.com . Please keep images under 250kb each with the entire email attachments being less than 2MB. Pay based on experience. Currently, Fancy Pants Designs does not offer a health benefits package, however, for full time employees there are other benefits and options available. If you would like to discuss anything with Jared prior to sending in your information, please contact him via email (as above) and he will get back with you as soon as possible. Okay...another quick update... we will go ahead and extend the deadline to tomorrow at 5pm MST when our offices close. I (Jodi) made a trip into our offices today, just to download the emails and open the box up again. But there are just so many entries and such large files that it fills back up within an hour. So, with no one working this weekend, the emails filled up the inbox. Tomorrow, we will download emails every half hour (or so) which *should* leave the box open nearly all day. Anyone sending an email should be able to get it to go through! Sorry for the inconvenience, but the mailbox can only hold so much and the number of entries being received all at once is just filling it right up... we appreciate your patience and we should be able to have everything under way tomorrow! Thank you for your persistance and for sharing your talents with us! I just wanted to drop in after seeing all of the posts and worries if your entry arrived or not! If we see any problems, or a full mailbox, we will allow the entries to come in beyond our deadline and will try our best to make sure they are all here!! Just wanted to relieve some stress :)!! !